Cooking since: for the last 46 years! What do you pack on a picnic? Here in Provence we love simple and tasty summer picnics. My choice would be a beef terrine, fresh Provencal goat’s cheese and a fruit tart made with fruit from my orchard. What do you always pick up at the farmers market: Seasonal produce – but we also have our own kitchen garden that grows in pace with the seasons. 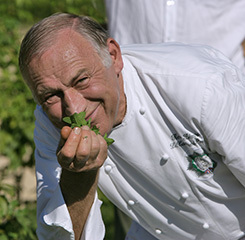 Budding chefs can hop over to “La Bastide des Saveurs” for one of my cookery classes! What is your top cooking tip? If you want to avoid difficulties digesting garlic, you have to blanch it 3 times. You’ll see, it really works! What would you take with you on a deserted island? The cookery book my family gave me on Hostellerie Bérard’s 30th anniversary. It was so moving! What makes you laugh? The fun and friendly exchanges we have in the kitchen during my cookery classes. We laugh a lot at La Bastide des Saveurs! What motivates you? The changing seasons and new produce they bring. I have a great job – no routine, just passion! What advice would you give home chefs? Stay humble and pay attention to cooking times and seasoning. And continue to love cooking of course!